Current: Joel is lead pastor for Redeemer Community Church, which he helped to found in 2008. 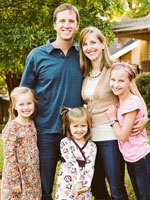 He previously led University Christian Fellowship for nine years. What Samford faculty or staff member had the most influence on you and why? Dr. Robert Smith (professor of preaching) is not just a great preacher, he is a great teacher of preaching. He knows when to encourage and when to challenge. He continually reminded me that the key to preaching was not in the presentation, but in the preparation. I need to go to God's word and study the preaching text-pour over it, pray over it, weep over it, let it shape me and lead me to worship. This was hard work, but once this happened, preaching was easy. Preaching simply became the overflow of this personal experience with God through His word. And, I will never forget Dr. Smith leaving me a message one night around midnight asking to meet with me. Who does that? What could he possibly want to talk about that was so urgent? All these different scenarios were bouncing around my head, and most of them ended with a fervent rebuke. Well, we met early the next morning in his office and all I can say is, that with joyful and sincere tears in his eyes, he blessed me. He prayed over me and spoke deep words of affirmation concerning God's calling on my life. I've never felt so humbled and encouraged. What would you say is the key to success in today's world? I'd say that the first key to success is to redefine success. Success is not looking sideways at others and seeing how you stack up and compare. Success is looking up to God and fixing your heart and mind on Him. It's obeying God in all of the small things, which few others, if any, will notice. Obeying God in these unobserved tasks becomes your secret act of worship. And ultimately, all success comes from trusting in what God has done and not in what I am doing. What is a favorite Samford memory? Once, our Greek professor, who sensed a lack of attention from all of the class, stopped parsing participles on the board, turned around and calmly said, "Did you know that this morning just a few miles away there are girls lined up at an abortion clinic trying to decide if they should keep or abort the life that is in them?" He then went back to writing on the board for a bit as if he hadn't said a word. After a while, he stopped again and turned back around and continued, "…and yet, here you all are sitting in this classroom, parsing Greek words. So, I'm assuming that if you are in here studying New Testament Greek instead of out there helping preserve life, then you must be absolutely convinced of the importance of what we are doing here and that God has called you to do this. If so, should you not give this class your full attention? "I will NEVER forget that class or those words. What was your motivation for starting Redeemer and how has it evolved through the years? Sixteen years ago, my wife and I chose to live in a relatively poor and un-churched neighborhood on the east side of the city of Birmingham. We began reaching out to our community in small ways at first--inviting neighbors over for dinner or for porch gatherings. This led to larger outreaches and then eventually, we began praying about the possibility of starting a church. While there are many good churches in Birmingham, there was a large vacuum of Gospel-centered churches in this part of the city. Finally, we took a step of faith and started Redeemer Community Church in 2008 with 15-20 people meeting in our living room. Why is giving back to the community so important to you? A Bible verse that has had tremendous impact on me and my family is Jeremiah 29:7, which says, "But seek the welfare of the city where I have sent you into exile, and pray to the LORD on its behalf, for in its welfare you will find your welfare." This is why we've been a part of not only starting a church, but also starting soccer leagues, basketball outreaches, an elementary school, community gardens, etc. as well as helping out with the existing structures that are struggling. I believe that the Gospel not only changes us individually, but can transform entire communities for the glory of Jesus.